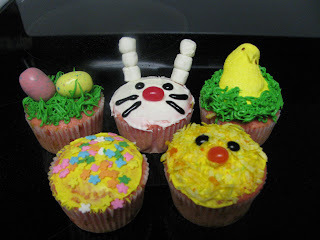 Easter is this weekend, which means another excuse for me to create fun cupcakes for everybody! This time, I'm splitting them between my friend Joanna's Easter picnic and my boyfriend's Easter Lunch/Dinner. Finding smaller orange jellybeans so it would appear more "beak-like"
I think I was exhausted by the time I was done with the cupcakes because the next morning, the cupcakes looked SO much better. I'm actually kind of proud of them! Also, the people who tried the cupcakes this afternoon said they were tasty so I'm satisfied!